Are you a bride looking for Atlanta wedding florist? I would love to help you find one! I know how wedding planning goes these days. You log in to Pinterest and you save this bouquet and pin that bouquet, and before long you have visions of ranunculus and peonies running through your head. You have a vision of what you want, but you're not sure who you should hire to bring your vision to life. 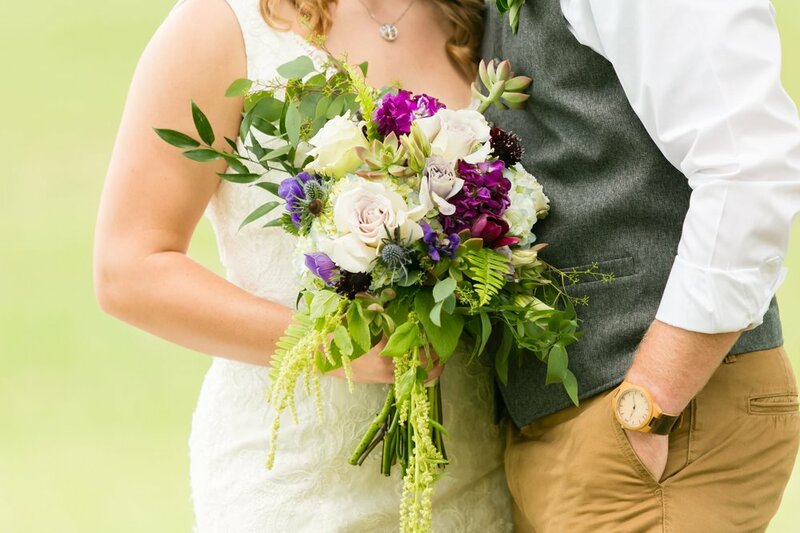 I want to make that a bit easier for you by connecting you to the Atlanta wedding florist behind the gorgeous Pinterest images! I've pulled together a collection of some of my favorite bridal bouquets that I've photographed over the last few years, and I've included website links to the floral designers to help make it easier for you to get in touch with the talented men and women who put these lovely creations together. This blush and white bouquet by Atlanta wedding florist Tulip Blooming Creations makes me swoon! It feels like she's carrying an English garden in her hands. To view more from Mac and Brittney's Piedmont Driving Club wedding, click here. 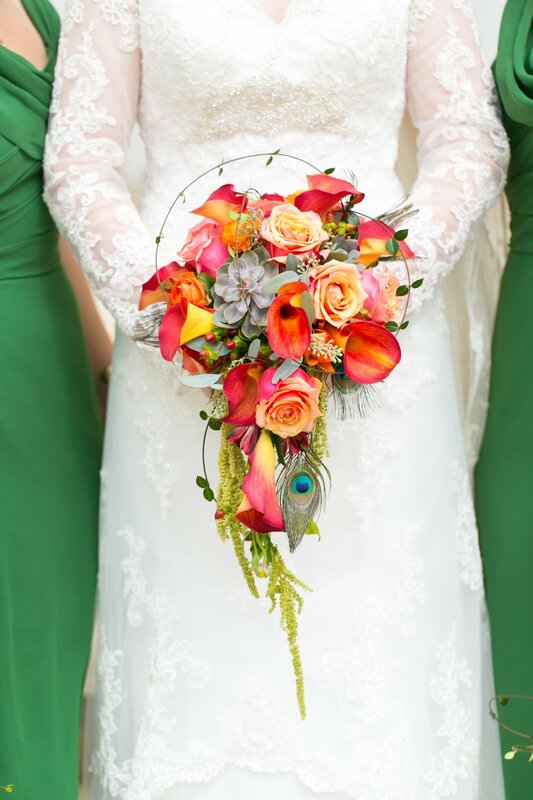 Annie's gorgeous bouquet by Atlanta wedding florist Parties To Die For was overflowing with color and texture! Click here to view more photos from Christian and Annie's wedding at The Estate. Danielle's asymmetrical bridal bouquet by Atlanta florist Forage and Fleur was oh so lovely. I especially love the anemones! Click here to view more photos from Steven and Danielle's Eagles Brooke Country Club wedding. Katie put this glorious, warm toned bridal bouquet together herself! Can you believe that? She's so talented! I had to include this one just because it's so beautiful. Amber's classic cascading bouquet by Sharpsburg florist Bedazzled Flower Shop was designed to mimic the style of the bouquet her mother carried when she got married. To view more from Joseph and Amber's Something Special wedding in Newnan, click here. Jeff and Laura got married on Jeff's family cotton farm, so of course her Southern bouquet featured fresh cotton! I love the texture and warm tones of her bouquet. To view more from Jeff and Laura's intimate Alabama farm wedding, click here. Where is the heart eyes emoji? Taylor's bridal bouquet was the epitome of all things feminine. The texture of the peonies and the color of the ribbon make this bouquet so stunning! To view more from Gamble & Taylor's Piedmont Driving Club wedding, click here. 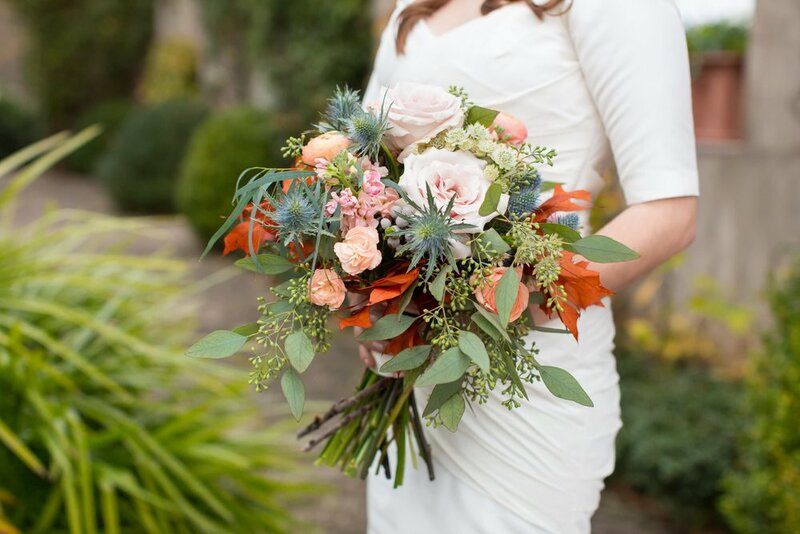 I love how the peach and orange flowers in Corinne's bouquet contrast with the greenery that's mixed into the design. 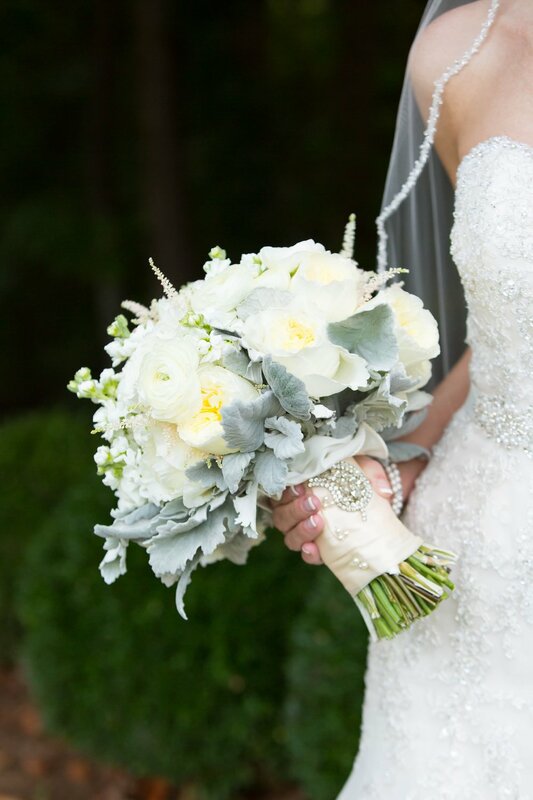 Her bouquet was designed by Atlanta wedding florist Petals a Florist. Anne's white peony bridal bouquet was designed by Atlanta wedding florist Findlay Rowe Designs. It was the perfect arrangement for her sophisticated Southern wedding. Monica's vibrant rose and orchid bouquet was the perfect contrast to her simple, elegant wedding gown. To view more jewel toned inspiration from this Fernbank Museum wedding, click here. Kristin's textured green and white bouquet was the perfect design for her Summerour wedding. I absolutely adore Noelle's funky, vibrant bridal bouquet by Lagrange wedding florist Sweet Pea Floral Designs. The design is fresh and fun, and it coordinated perfectly with her bridesmaid's yellow dresses! To view more from Kevin and Noelle's Glendalough Manor wedding, click here. This purple, pink, and white bouquet was perfect for Douglas and Abigail's rustic farm wedding at Abby Manor. Liz's bouquet was all about the BLING! Rhinestone and pearl pins were mixed in with the peonies, making her bouquet one of the most stunning arrangements I've seen. And if you think her bouquet is beautiful, you have to see the arrangements at her Biltmore ballrooms wedding here and here! This delicate peach and green bouquet added a touch of warmth to Jason and Amanda's winter wedding. Kim wanted an organic, asymmetrical look for her bouquet, and Atlanta florist Gertie Mae's Floral Design delivered in a big way! It was the perfect design for her Alex and Kim's Summerour wedding. Anytime a bride tells me she's working with Atlanta wedding florist Faith Flowers, I get so excited! Her work is always beautiful and she captures the spirit of the bride's wedding style. I adore this beautiful fall bouquet that Lina carried for her fall wedding at Summerour Studio! 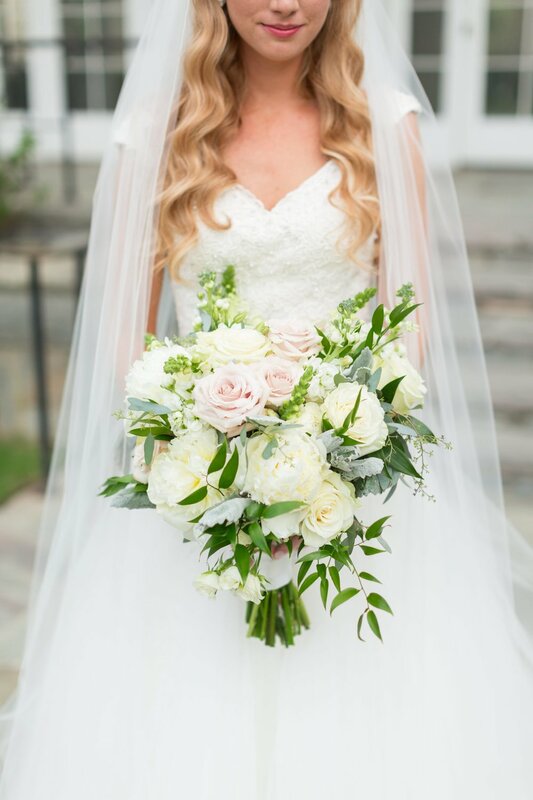 This peach garden rose bouquet by Atlanta florist Michelle Goodman was the perfect arrangement for Jenna's classic Southern wedding at Oakton House and Gardens. Sage and white bridal bouquet by Atlanta wedding florist Alpharetta Flower and Garden Market. If you love this bouquet, you have to take a look at the rest of the details from her timeless Southern wedding at the Country Club of the South. Muted blush peony bouquet by Savannah wedding florist A to Zinnias. To view more from Evan and Audrey's Mansion at Forsyth wedding, click here. Katie's vibrant bouquet by Atlanta florist Acorn Home & Garden was the perfect fit for her plum and gold wedding. To view more from Andy and Katie's Powder Springs wedding, click here. Marianna wanted a timeless look for her wedding, and this classic cream bridal bouquet by Atlanta wedding designer A Divine Event was the icing on the cake. To view more from Michael and Marianna's classic Greystone at Piedmont Park wedding, click here. Fall inspired bridal bouquet by Atlanta wedding florist Laurens Florals. To view more from Zach and Brittany's elegant fall wedding at Wieuca Road Baptist Church, click here. Blue and white bridal bouquet by Atlanta florist Kimberly Evans. 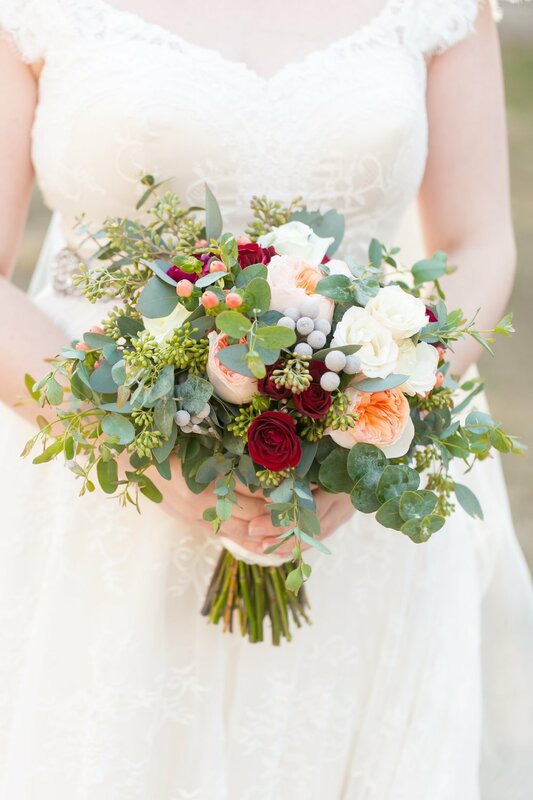 I love the mix of soft gray, cream, and wine colored flowers in Brittany's bridal bouquet by Melissa Senn of Magnolia House and Garden. It was the ideal palette for her joyful November wedding. The peach garden roses in Abby's bouquet give the design sophisticated Southern charm. Her bouquet was designed by Atlanta floral designer Faith Flowers. Visit their blog post to view more Foxhall Wedding Photos. Melissa's pink and white bridal bouquet was designed by Atlanta florist Unique Floral Creations. It brought a classic touch of color to her wedding design. To view more photos from Ben and Melissa's Country Club of the South wedding, click here.